Thurmond is a train station in Thurmond, West Virginia, United States, that is served by Amtrak, the national railroad passenger system. The Cardinal, which runs three times each week between Chicago, Illinois and New York City, New York, passes by the station three times each week in both directions, but since Thurmond is a flag stop, the trains only stop "when passengers are present, either on the train or station platform, and ticketed to and/or from this station." The station is on CSX Transportation's New River Line and is located on the east bank of the New River. It is one of Amtrak's least-busy stations, it was the second least-busy for fiscal year 2006, after Greenfield Village, Michigan, which was less traveled because it had been discontinued from the Amtrak regular schedule in April 2006 (being open only to groups after that point). Of the 509 stations served by Amtrak in fiscal year 2012, Thurmond was again the second least-used station, just ahead of Sanderson, Texas. The long, narrow two-story slate-roofed wooden structure, built in 1905 by the Chesapeake and Ohio Railway, also houses a railroad museum and a visitor center for the New River Gorge National River. The depot features a projecting bay that served as a signal tower. The interior originally possessed three waiting rooms: one for white men, one for white women, and one for African Americans. The building was renovated in 1995. It is a contributing structure in the Thurmond Historic District. ^ "Thurmond, WV (THN)". Amtrak. Retrieved November 19, 2013. ^ "Amtrak Fact Sheet, FY2017, State of West Virginia" (PDF). Amtrak. November 2017. Retrieved December 16, 2017. ^ "Amtrak System Timetable: Summer Fall 2013" (pdf). Amtrak. July 15, 2013. pp. 71 & 131. Retrieved November 19, 2013. ^ "Amtrak System Timetable: Spring 2005 - Summer 2005". April 25, 2005. p. 80. Retrieved November 19, 2013. ^ "Great American Stations: Thurmond, WV (THN)". Amtrak. Retrieved November 19, 2013. ^ "Great American Stations: Sanderson, TX (SND)". Amtrak. Retrieved November 19, 2013. ^ Chambers, S. Allen (2004). 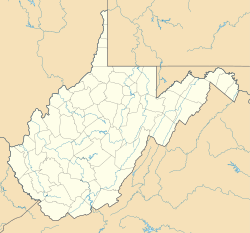 "Capital Center and South Central West Virginia". Buildings of West Virginia. Oxford University Press. pp. 114–115. ISBN 0-19-516548-9. ^ Harper, R. Eugene (September 15, 1983). "National Register of Historic Places Nomination: Thurmond Historic District" (pdf). National Park Service. Retrieved November 19, 2013.